However, the online self-service portal is by far, the easiest method to update your details. 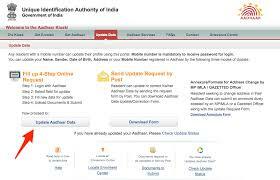 Visit https://ssup.uidai.gov.in/web/guest/update to update your card in five easy steps. Enter your Aadhar number and an OTP (One Time Pin) will be sent to your registered mobile number. Enter the OTP and captcha to log in to the portal. Things to Note: It is mandatory to have your mobile number registered for online Aadhar Card Corrections. If it is your mobile number that you wish to correct, then please visit a local Update Centre. Choose the field that needs to be updated. You can also choose more than one field. Things to Note: You can update your Name, Address, Gender, Date of Birth, Mobile Number and Email ID through this portal. In case you wish to update some other detail, please visit the nearest Update Centre. Except for Email-Id, Mobile or Gender update requests, corrections in all other fields need to be supported by other proofs. Carefully review the entered data. Make sure that is complete and accurate in both English and local language. This step is extremely important as users often make other mistakes while working in haste. Things to Note: The Date of Birth will not appear in a local language and all numbers are transliterated into English. Requests to change this to vernacular calendars will not be entertained. And you’re done! Please carefully note the Update Request Number (URN) to track the progress of your request better. You may also print or download a copy of the Update Request. Please note that the information is updated immediately. Only after careful verification of the request can the updated and validated. You may check the progress of your Update status using the URN.